A man who entered the United States illegally and was deported twice has been jailed for killing his 18-year-old ex-girlfriend. 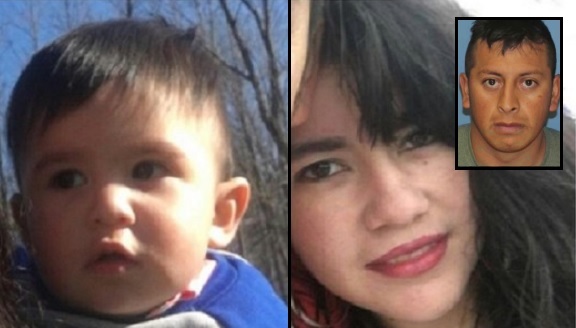 The victim's 14-month-old boy was the subject of an Amber Alert last week when his mother was found dead but authorities have still not located the missing toddler. 25-year-old Evarardo Donoteo-Reyes has been charged with tampering with evidence but prosecutors say they expect to file more charges once investigators determine 18-year-old Selena Hidalgo-Calderon's cause of death. An extensive search is underway for the victim's son, Owen Hidalgo-Calderon, but investigators fear he is dead. Police searched the couple's home in Wayne County and the surrounding area but no sign of the toddler was found. Tuesday morning the Amber Alert was canceled but authorities did not say why. Donoteo-Reyes and Hidalgo-Calderon both lived at and worked on a 350-acre farm in Sodus where hundreds of volunteers searched for signs of the missing boy. Hidalgo-Calderon's body was found in a wooded area near their home. She was buried between two logs and covered with sticks and dirt, according to police. Prosecutors say Donoteo-Reyes was later arrested outside of Wayne County and confessed to moving Hidalgo-Calderon's body. He appeared in court Tuesday on charges of tampering with evidence but investigators are waiting for an autopsy to determine how Donoteo-Reyes died before they can charge him with her murder. Donoteo-Reyes told police he moved his girlfriend's body because he feared deportation or being blamed for her death. A Wayne County Sheriff’s Office spokesperson said, "On May 24, ICE lodged a detainer on Everardo Donoteo-Reyes aka Alberto Ebavardo Gutierrez-Reyes, an illegally present citizen of Mexico, with the Wayne County Sheriff’s Office following his arrest on local charges." Selena Hidalgo-Calderon was also in the US illegally and was in the process of being deported but her family applied for asylum. She is a Guatemala native and reportedly had the child with another man who is not Donotea Reyes. Wayne County Sheriff Barry Virts said, "We have to look to reality here that he is concealed somewhere here on the farm. We will bring justice. We are going to keep after this until we get the evidence and the information we need." Ask Nancy Pelosi to help in the search..
@ Icu, lol, she can't find matching synapses in her own brain.